Dominican born artist Charo Oquet works on the cusp between the visual and the performing arts, displacing viewer expectations by tweaking the presentation codes of performance and installation. Part of a tradition that includes Mike Kelley and Rara processions, she enjoys playing a plurality of roles. She make contemporary art, films, curates exhibitions, edits books, staged events, writers and performs and founded Edge Zones and festivals that have left deep impacts on contemporary culture in Miami. Her performances and ephemeral installations combine the body, movement, sound and idiosyncratic experience in turning uncertainty into an art material at once sculptural and live. Oquet follows her self declared imperative of ‘kinetic contemplation’ to produce a trajectory that is restless in terms of the forms and methods that she deploys even as she achieves a consistency of speculative procedures. She has exhibited, performed, curated and lectured around the world since 1981. 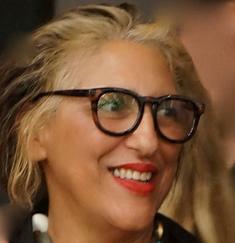 Her awards include MAP Fund ’15; Miami Light Project – Here & Now ‘15; the Grand Prize in the Dominican Biennial, Museum of Modern Art of Santo Domingo ‘11; Florida State Artists Fellowship Award ‘14 & ‘06; South Florida Cultural Consortium Visual and Media Artists Fellowship and the QE II Arts Council of N.Z. Artist Fellowship Award. She is known for her dynamic installations, which incorporate idioms of popular Afro-Caribbean religions. Her work has been featured in notable publications, including Atlantica, index, El Pais,Vogue China, The Miami Herald. Recent exhibitions include 26 Biennial of Santo Domingo, Museum of Modern Art Santo Domingo. Oquet’s work is found in the permanent collections of the Centro Atlántico de Arte Moderno, (CAAM); Las Palmas, Spain; New Zealand National Museum, Wellington, N.Z. ; Govett-Brewter Art Gallery, New Zealand; and the Modern Art Museum of Dominican Republic to name a few. As an art activist, she founded Edge Zones, a non-profit arts organization in Miami, FL, The Miami Performance Festival and Zones Art Fair Miami. Oquet is the author of SuperMix, Wet 2 and Wet. As the artistic director of Edge Zones and the festivals she has curated numerous exhibitions and festivals since 2003.